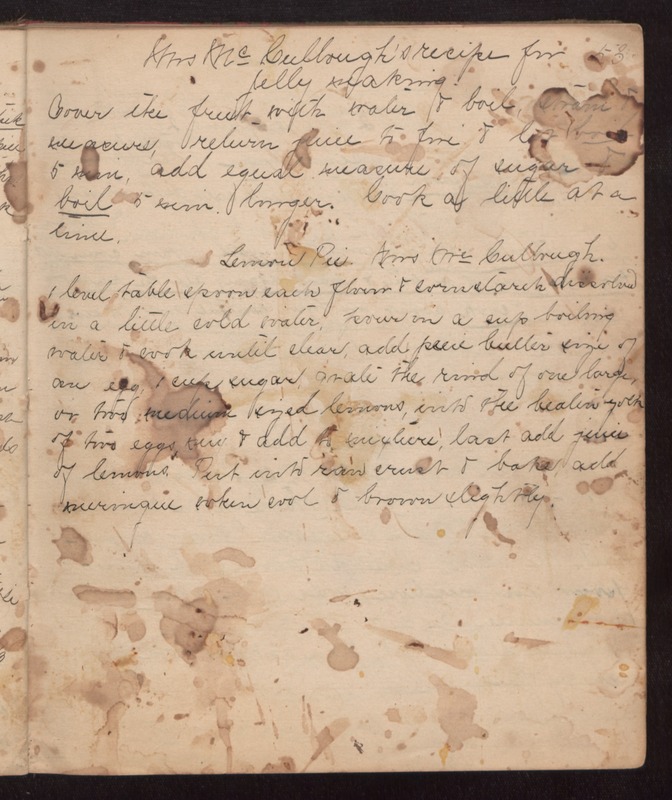 Mrs McCullough's recipe for Jelly making. Cover the fruit with water & boil, strain & measure, return juice to fire & let boil 5 min, add equal measure of sugar & boil 5 min. longer. Cook a little at a time. Lemon Pie. Mrs McCullough. 1 level table spoon each flour & cornstarch dissolved in a little cold water, pour in a cup boiling water to cook until clear, add piece butter size of an egg, 1 cup sugar, grate the rind of one large or two medium sized lemons, into the beaten yolks of two eggs, mix & add to mixture; last add juice of lemon, Put into raw crust & bake add meringue when cool & brown slightly.